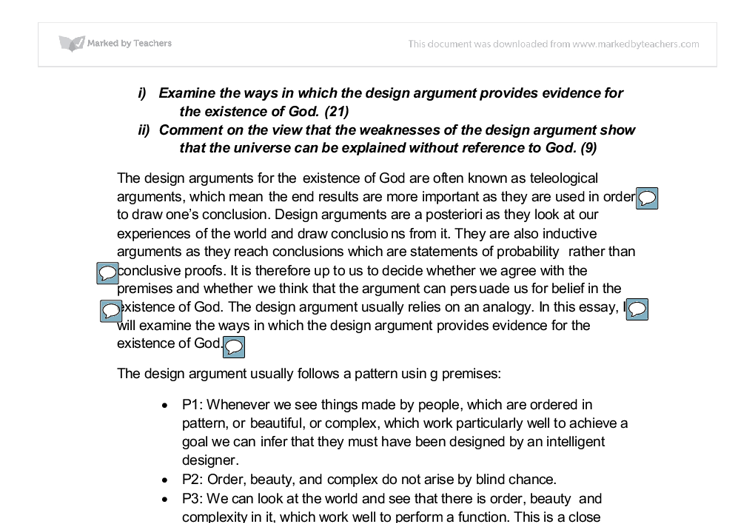 Examine the strengths and weaknesses of the design argument for the existence of God. i) Examine the ways in which the design argument provides evidence for the existence of God. (21) ii) Comment on the view that the weaknesses of the design argument show that the universe can be explained without reference to God. (9) The design arguments for the existence of God are often known as teleological arguments, which mean the end results are more important as they are used in order to draw one's conclusion. Design arguments are a posteriori as they look at our experiences of the world and draw conclusions from it. They are also inductive arguments as they reach conclusions which are statements of probability rather than conclusive proofs. It is therefore up to us to decide whether we agree with the premises and whether we think that the argument can persuade us for belief in the existence of God. The design argument usually relies on an analogy. 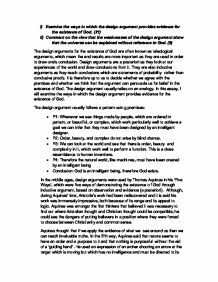 In this essay, I will examine the ways in which the design argument provides evidence for the existence of God. The design argument usually follows a pattern using premises: * P1: Whenever we see things made by people, which are ordered in pattern, or beautiful, or complex, which work particularly well to achieve a goal we can infer that they must have been designed by an intelligent designer. ...read more. The first criticism made by Hume was that the analogy made between a watch and the world is weak. Characteristics of purpose and design might be obvious in a watch but they are not nearly as obvious in the world. Hume also argued that the world does not necessarily mean that someone must have had the idea of design. Even if we do see order in the world, it does not enable us to leap to the idea of a divine ordered. All we can say is yes there are limitations in the world. Oder Hume believed, is a necessary part of existence. If everything was random and noting suited its purpose, the world would not be here anymore. Hume also criticised the design arguments because of their assumptions that if we look at the effects, we can infer the cause. Aquinas has claimed that this was possible. He said that in looking at the evidence around us, we can work backwards and see that God must be the cause. However, Hume attacked this reasoning saying that cause and effect does not operate as simple as this. Hume said that even if we can assume a creator, there is no reason to suggest that this creator is a Christian God. John Stuart Mill on the other hand took a different approach. ...read more. Randomness is not something that can be demonstrated. It is impossible to prove that something has happened by chance. Tennant, who is a modern supporter of the design argument, believes that it is possible to imagine a chaotic universe, where there are no rules. He believed that the universe is not evidently chaotic. In fact, it appears to be designed to support life. Evolution itself is supported by biologists as an unregulated principle, in fact works to the advancement of species supported by a world that provides all that is necessary to promote life. Tennant argued for divine design on the basis of the anthropic principle. The argument that the natural laws of the universe have been fine tuned to allow human life to exist. He argued that the world is best explained if we accept the existence of God. Swinburne, who is also a modern supporter of the design argument, believed that scientific discoveries provide good grounds for belief in God and argued that we need an explanation for the fact that the fundamental laws of nature operate with such regularity. Swinburne said it stretches our credibility if we are asked to believe that the laws of physics are just a coincidence and that it is simpler to conclude that the laws exist because of the divine intelligent being. Swinburne believes Paley's argument is sound and also argues in favour of Tennant that the beauty of the natural world is evidence of the existence of God. ...read more. I will assume that this essay is intended only to answer part i, since there is no clear distinction between different questions. The last bit of the essay does present some criticisms of the design argument, which are not strictly relevant to question i, but which are not presented with anywhere near enough focus to address question ii. Description of the design argument and facts surrounding it are largely accurate and pretty clearly presented. There is an absence of waffle, but a few sentences betray confusion and do not make sense. As noted above, rather too much attention is given to criticisms of the design argument and rather too little to explaining how the design argument supports the existence of God. Answering this question would require more consideration of how the argument works. Generally the grasp of the material is good and well-presented and so would deserve a good mark, but the student risks letting themselves down by not answering the question. He does not provide a master principle to judge whether an action is intrinsically flawed, but insists that prudence (practical wisdom) is to be used for the most part. Prudence is the most important of the cardinal virtues as it pertains to intellect and is considered the cause of all other virtues. Yet plants and animals are non-rational beings, something or someone must be directing them to their goal. To summarise, Aquinas demonstrates how the design argument is strong because, there is clear undoubted, beneficial order in the world which could not be by chance or intelligence of that being, the being must by directed by something of intelligence. This systematic structure is reflected in the structure of the dialectic process by which we come to knowledge of the forms Overall Plato's theory of Forms suggests that there exists an abstract and eternal notion of concepts such as 'goodness'. Aquinas believes that because of this religious language can be meaningful. Aquinas rejected equivocal language this is when the same word has an entirely different meaning in two situations. E.g. the nut on the tree, the nut on my bicycle. This eternal world is more real than the world we experience through the senses (or Empirical knowledge - knowledge based on our senses), and it is the object of knowledge, pure knowledge, not opinion. Before Plato came up with this theory, philosophers before him, namely Heraclitus, viewed the world of as a subject of constant change. model, qualify it, so that we realise that it?s not literally what God is like. To the statement ?God is good? we need to add the qualifier that God is ?infinitely good?. It gives greater depth into the thinking of God?s goodness until eventually there is better insight into God?s goodness.